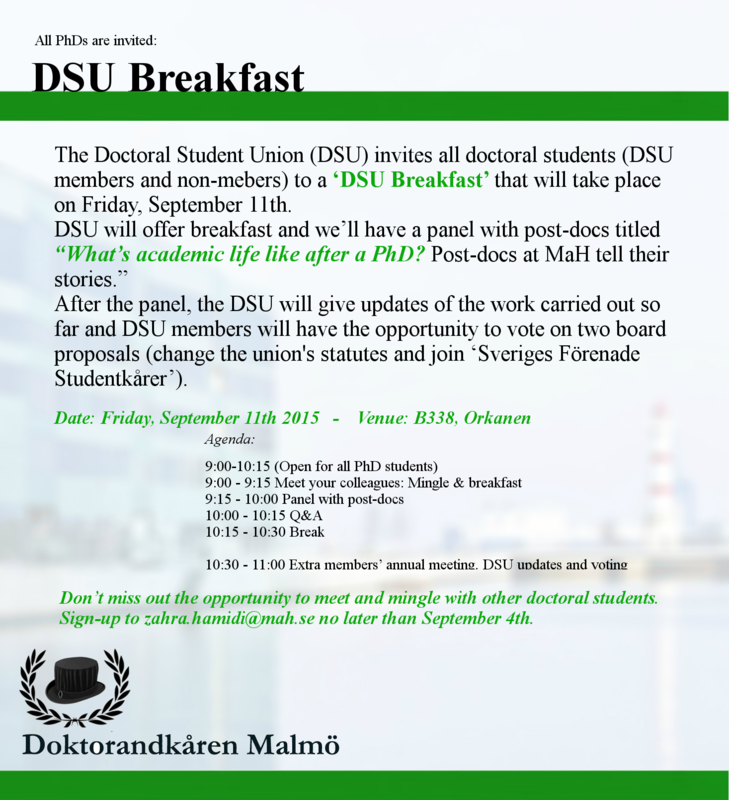 The Doctoral Student Union (DSU) invites all doctoral students (DSU members and non-mebers) to a ‘DSU Breakfast’ that will take place on Friday, September 11th. As the name implies, the DSU will of course offer breakfast and we’ll have a panel with post-docs titled “What’s academic life like after a PhD? Post-docs at MaH tell their stories.” After the panel, the DSU will give updates of the work carried out so far and DSU members will have the opportunity to vote on two board proposals (change the union’s statutes and join ‘Sveriges Förenade Studentkårer’). 10:30 – 11:00 Extra members’ annual meeting. DSU updates and voting. Don’t miss out the opportunity to meet and mingle with other doctoral students. Sign-up to zahra.hamidi@mah.se no later than September 4th.